Fri-YAY!!! So Monday I made you brownies and today I’m making you breakfast. And guys, this isn’t just any breakfast. This is oatless breakfast. Zucchini Oatless Oatmeal to be exact. I’m showing the Paleoans some love today. You’re welcome in advance. I love oats, BUT sometimes you just need to mix things up and give the gut a break. You know? A few weeks ago when it was 90 in Arizona, I was like I just can’t eat oats for breakfast. It’s just too hot and there was a lonesome zucchini dying in my fridge begging me to do something with it. So I did. I made Zucchini Oatless Oatmeal with it and it was awesome. As you know, I’m pretty obsessed with zucchini and putting it in everything. Well, obsessed with all squash really. I was thinking the other day about this love of mine for squash and how I go through phases with eating each of them. I realized though that my phases aren’t really phases at all. They’re seasons. You see during the winter I’m eating butternut, pumpkin and spaghetti squash like it’s going out of style. Then in the summer I’m like giveme all the zucchini! Okay, so I eat butternut year round BUT the reality is it is really HOT in Arizona for like 10 months of the year. So that means if I were to always eat what was in season, I would be eating zucchini all the time and boy that would just not be fair to the others and well, kinda boring. So in all fairness to the oats and squashes and Paleons, let’s eat Zucchini Oatless Oatmeal every now and then. Mmk? Now understandably, you are skeptical about Zucchini Oatless Oatmeal. I’m a mind reader. Didn’t you know that? 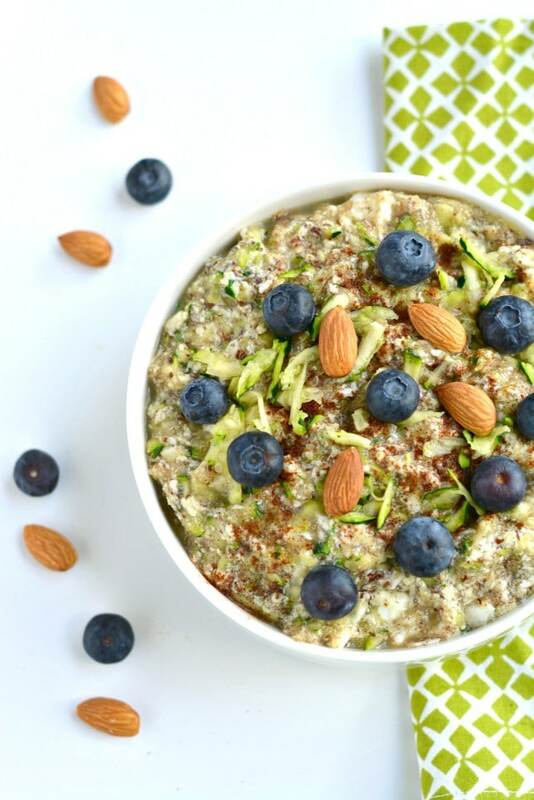 BUT I’m telling ya, this Zucchini Oatless Oatmeal is D-E-licious! You’ll be surprised. So before you judge an oatmeal by it’s oats, give it a fair chance. This is a judgement free zone! Worst case. You can always bake it into a muffin. It’s all about options people. Oh, but before you go. 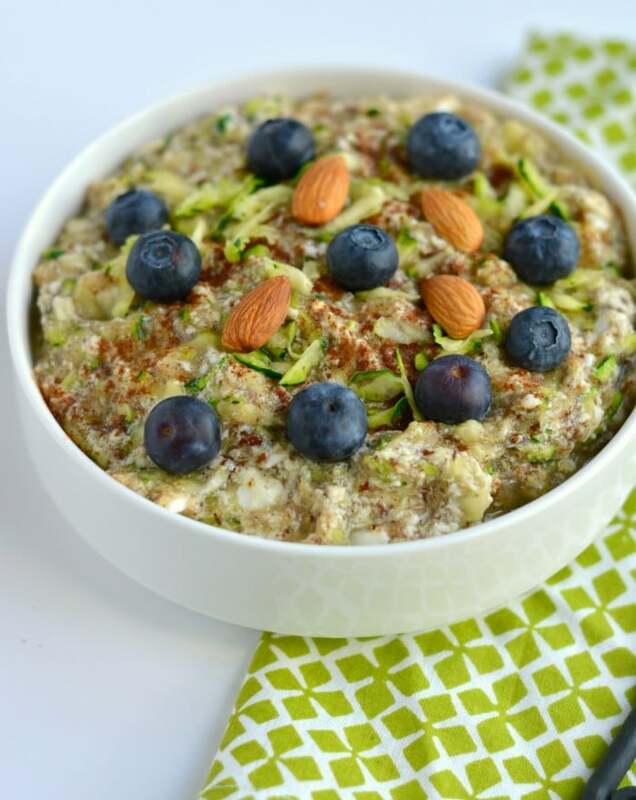 I had another awesome thought about this Zucchini Oatless Oatmeal. Technically, this is like overnight “oats,” minus the oats of course. The recipe has ground flaxseed. Have you heard of it? Well, it’s like the magician of omega powerhouses. One of the best you can eat really. AnyWHO….you could totally throw all of the ingredients for this in a mason jar the night before and it will magically puff up like puff the magic dragon overnight. Toss it in the microwave the next morning and voila! 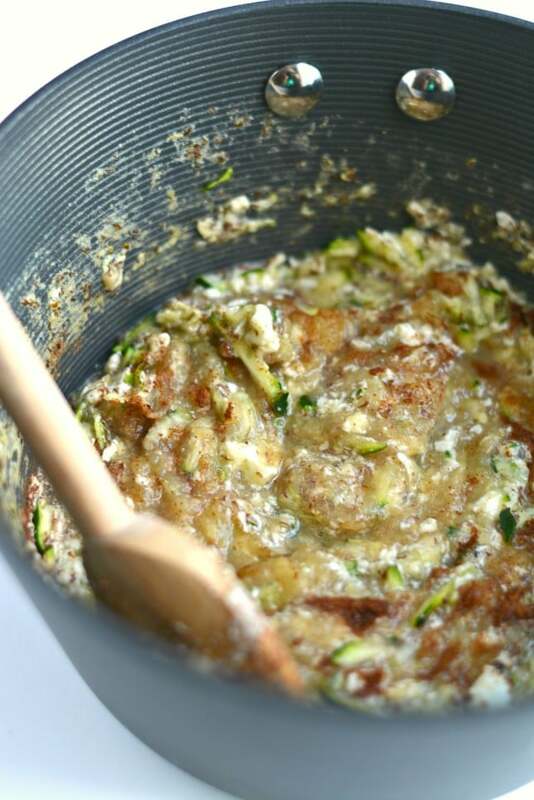 You’ve got overnight Zucchini Oatless Oatmeal. My work here is done! 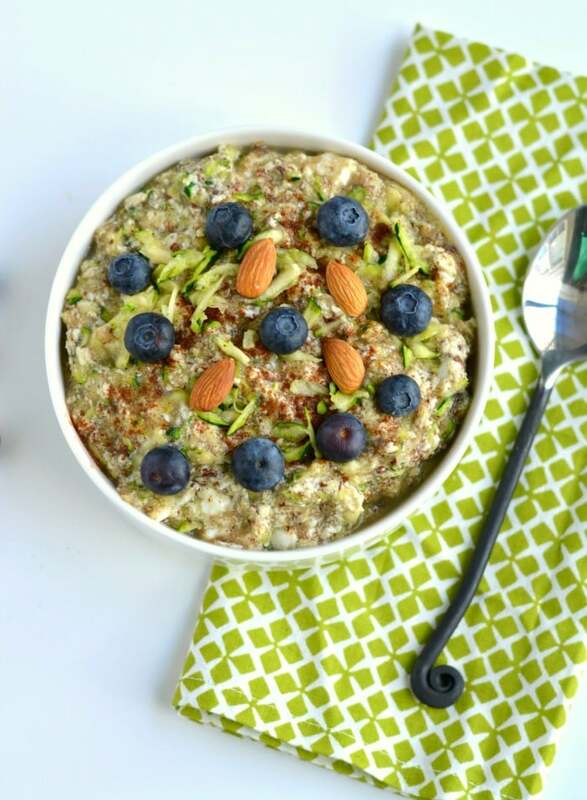 Zucchini Oatless Oatmeal is a Paleo twist on a classic bowl of morning oatmeal. Made with eggs, almond milk, zucchini, applesauce, flaxseed and cinnamon, this simple bowl of goodness is packed with protein and fiber. A nutritious way to stay full all morning! Add egg whites, milk and flaxseed to the saucepan, stirring constantly as they combine until they thicken. Do not let it sit without stirring otherwise the eggs will scramble. Reduce heat to low and add applesauce, zucchini and cinnamon to the mixture stirring to combine. Allow mixture to thicken to desired consistency. Remove from saucepan, place in a bowl and top with options toppings as desired. Does your eating follow the seasons? Have you had oatless oatmeal? 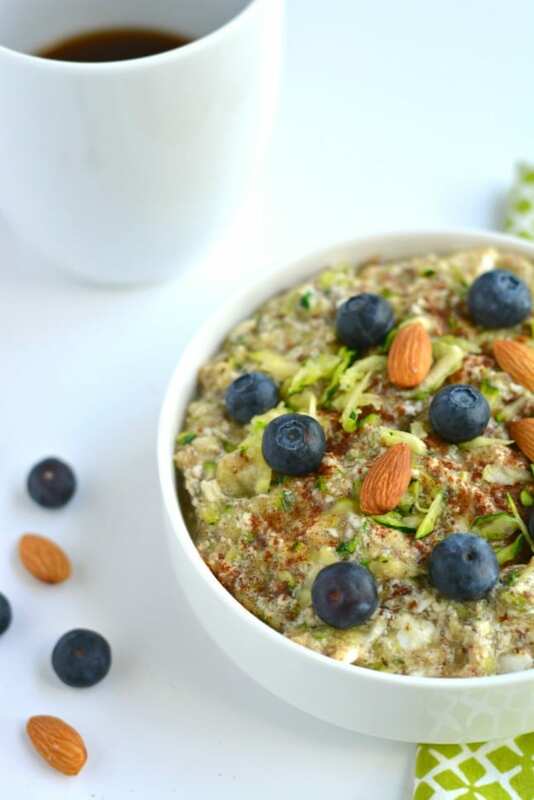 I haven’t tried an oatless oatmeal but really want to as I’ve seen a few on pinterest lately! Definitely will have to try! You’ll like it, you’re a squash lover like me! Oatless oatmeal! Aren’t you clever!! 🙂 I actually really want to try this. I especially love that I can stick it in the refrigerator the night before. Easy is definitely what I need in the morning! I hope you like it! The options are endless. I’ve made oatless oatmeal before, but it was with TVP. So this is basically a succhini breafast backe, which I am totally ok with. Love the idea! yum!! love all these ingredients so will definitely have to give it a try!! I definitely eat warmer, comforting foods in the winter and more salads, fruit, and smoothies in the winter. I still eat a lot of squash in the summer. I just love it so much! Thank you for posting this! I am looking for some lowe carb options as I experiement with carb cycling – and just trying to change up my habits as I have oats EVERY morning. Not a bad thing, but I think it’s a good idea to have some variety! It’s good to mix food up, same as fitness. I hope you like it! Megan, your recipes and food photography never cease to amaze me. I remember when I first started seeing “Zoats” on instagram in 2013, I was a little weirded out. But I tried it and loved it! This recipe is extra special because it’s grain free. i’ve made oatless oatmeal but with nuts. I like your lighter version! you know i gotta try! Oh I want to try that! Is the recipe on your site? This is such an intriguing idea. I should try this because I’ve been wanting to up my breakfast veggie game and oatmeal has just seemed to be too heavy with the warmer weather lately. Thanks for sharing, pinning! I’ve never tried “n’oatmeal!” I usually just go for regular oatmeal. But i’m up to try anything! Love the addition of veggies at breakfast – thats why I generally stick to scrambles. Me too! Egg salads every morning. I would have never thought of this combination but can imagine how great it tastes. Perfect pre-run fuel with all of those slow burning carbs. Love it! Yes! And it’s light too. You have such great recipes!!!! This is pure genius!!! I’ve seen people make zoats before but never without oats. totally wanna try this!!! What cool twist on paleo pats! It never really go cool here (granted, it’s not 90), so I’ didn’t do many oats at all this winter. I’m totally going to try this out next week! Hi this looks great! If I make the overnight version, how long would you recommend heating up in microwave for so that the egg whites cook? Thanks! I would recommend heating at 30 second intervals on medium heat and stirring in between so it doesn’t scramble until it’s cooked through. Is it possible to substitute the vanilla almond milk? Maybe coconut milk or water? I haven’t it tried it, but I’m sure any milk would work. can I use chia seeds instead of flaxseeds? I haven’t tried, but you should be able to. I want to try this now, but forgot to prepare last night! How can I get the same effect by cooking instantly? Or do the flaxseeds need to swell? What do you mean by instantly? In the microwave? I’ve never tried it any other way. Let me know if you do! Hiya! I mean that I forgot to soak the flaxseed overnight, and wondered if it would work if I just cooked this dish without any prior soaking? Also, do you grate your courgette on the smallest grater setting? How long do you continue to cook it for once the courgette is in the pan? There is no soaking required for the flax. I did not grate my zucchini. I grated it in a food processor by pulsing it several times. I’ve just made this Oat-less Oatmeal and it’s shocking how much it does resemble oatmeal. It’s so good! I used the Unsweetened Vanilla Almond milk and that worked great. Also topped it with blueberries and it sent it over the top. It’s so yummy that the whole bowl is going down the hatch. Thanks for coming up with this. Love that it’s low cal and healthy. That’s amazing! I know so many people are skeptical about it, but it really is tasty and the consistency is very similar. This sounds great! I wanted to 4x the recipe and bake it as a breakfast cassrrole. What tempersture would you suggest? This sounds delicious! How long would this stay good for if I put leftovers in the fridge? With the flax in the recipe, it’s going to dry out quickly so no more than a day maybe two I’m guessing. You’ll have to add milk to it when you reheat too. Let me know how it goes! I followed this recipe and it turned out tasty, but pretty soupy. Watching the video, that looks like a lot more than 1 1/2 TBSP Flax. I upped mine to 2 tbsp but still had a very soupy texture. Any suggestions? Hi Ali, you’re the only person who’s ever said that. It is only 1 1/2 tbsp in the video. You may have had too much zucchini in yours that added the extra moisture. My suggestion is either cook it longer until it thickens or squeeze out the moisture from the zucchini in a cloth before adding it next time. Hi can you do with whole eat if more Keto? is there a reason for only whites? Have you ever tried this with avocado instead of zuchs? Hi, I don’t understand your Keto question so let me know what you mean by that. The egg white are balanced with the healthy fat in the flax so there is already good fat in here. And I have not tried the with avocado instead of zucchini. I assume it would be very liquid-y and not have the same consistency as real oatmeal though.